Yesterday we keyed you in on some updates regarding a whole slew of Marvel properties from Ghost Rider to Daredevil. Well within that Variety article was a lot of information thrown around concerning all the reboots of franchises and tying most of them back to Marvel Studios founder and chief creative officer of Marvel Entertainment, Avi Arad. 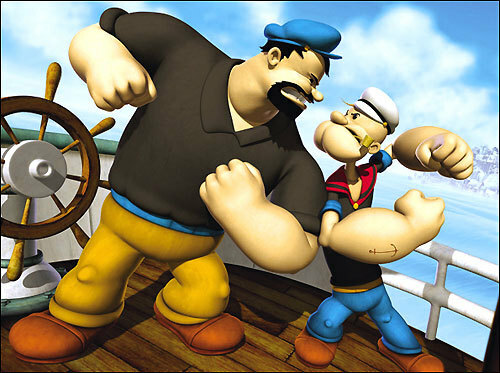 The guy has had his hands in all Marvel productions, but a little tidbit that almost went overlooked regarding a project Arad is working on outside of the Marvel universe: "Arad has also secured rights to make a CGI animated feature based on the venerable strongman Popeye." Popeye the Sailor Man has been an iconic comic character since its inception in the late 1920's, but an attempt at a cinematic adaptation of the spinach eating sailor left something to be desired. Hollywood legends Robert Evans and the late Robert Altman producing and directing respectively couldn't exactly find their footing with the film starring Robin Williams as Popeye. While it is considered by many to be a cult classic, some believe it is one of the worst films of all time. But with decades of comic strips and cartoon series at his disposal, Arad might to be able to find something to entice audiences, especially with CGI. Of course, I can't say I'm excited, because like 99.9% of everything that's being greenlit in Hollywood right now it's based on some previous intellectual property, and other old cartoons and comics like The Smurfs, Yogi Bear, Honk Kong Phooey and maybe eventually The Jetsons are just fueling the the trend machine that we can't seem to turn off. But who knows, maybe CG is the right approach to properties like this, and we might get something fun out of it. As long as they don't get "Full House's" Dave Coulier to voice Popeye. They better not f*kup Eugene the magical jeep! coming up next charlie brown the live action movie! starring seth rogen!